Accuride is one of North America’s largest OEM aluminum wheel manufacturers and suppliers of business vehicle components. The company’s products include business vehicle wheels, wheel-end components and assemblies, truck body and chassis parts, and other business vehicle components. In February, 2004, Kustom received a call from Accuride’s Cuyahoga Falls, Ohio, plant expressing concerns about the accumulation of wet snow on the building’s 150,000 square foot roof. Accuride’s plant workers had reported the sound of creaking steel-bar joists and multiple roof leaks. Each time it rained or snowed, plant workers grew more concerned about their safety. Because these types of issues often indicate the potential for a catastrophic roof collapse, Kustom immediately sent a team to assess the threat. Completing the initial investigation, it was determined the overload of wet snow was causing the plant’s roof to yield and putting lives at risk. 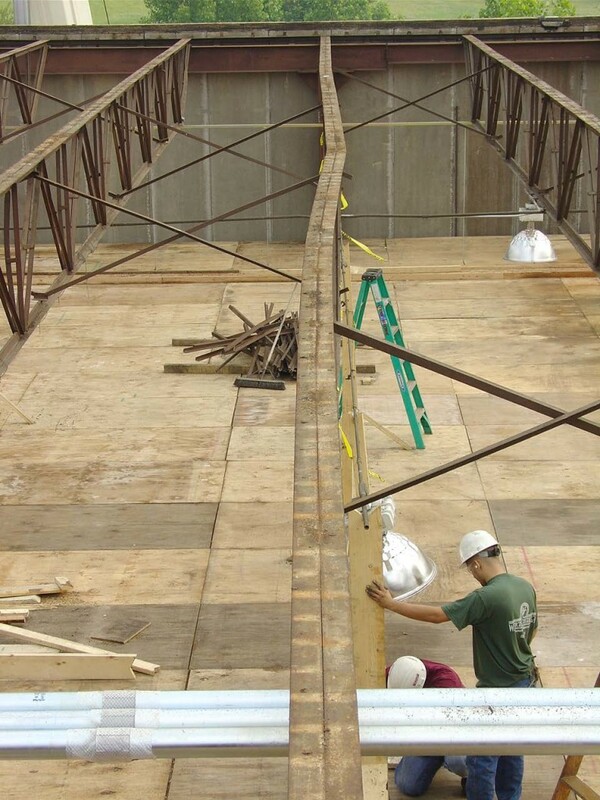 With decades of experience in business / industrial construction, Kustom has a successful track record in tackling complicated roof collapse emergencies. 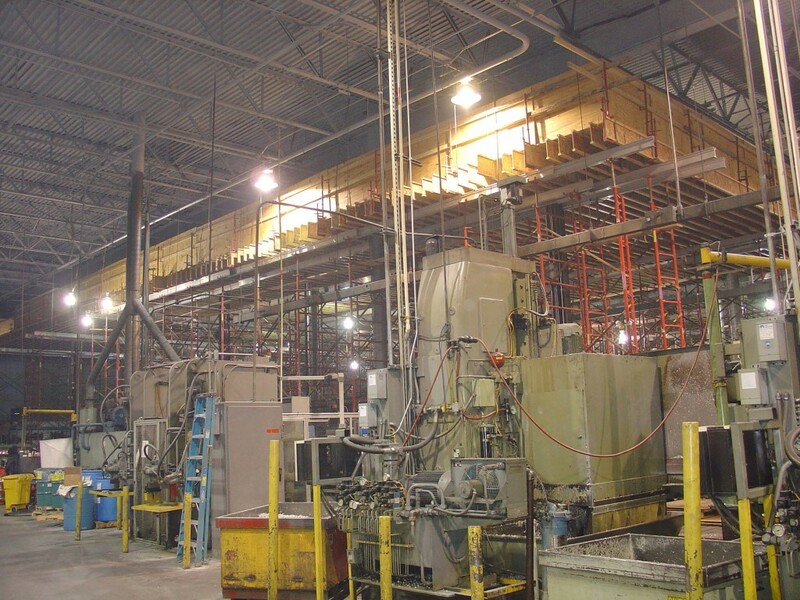 Still the only restoration contractor in the nation with its own steel fabrication facility and state-of-the-art equipment, Kustom’s expert steel crews are uniquely qualified to take on technically-challenging structural projects. Armed with a range of fully-integrated emergency services, Kustom was able to rapidly respond to the immediate threat and simultaneously develop viable solutions to repair the roof damage. Adding to the multiple challenges, Accuride requested Kustom complete the entire scope of work without interrupting its plant operations. Neutralizing the threat of a roof collapse was job number one. Kustom mobilized a team of over 100 to hand remove the snow using plastic shovels and wheel barrows. Inside the building, Kustom assigned an engineer and 25 steel workers to simultaneously shore up the weakened roof joists. Working non-stop, Kustom alleviated the immediate threat within hours of the initial call. After it was determined relocation of the plant to another site would cost Accuride over $3-million, Kustom explored the cost and viability of other options. The main challenge was removing and resetting the roof’s 85- foot long, 2-ton steel bar joists while plant operations continued down below. Along with a team of top-notch engineers, Kustom developed a creative solution which satisfied Accuride, the building owner, their respective insurance carriers, the local building department and OSHA. To protect plant workers from harm and harsh winter weather, Kustom erected a safety deck a few feet below the bottom cord of the steel bar. The deck was composed of a series of shoring towers in neutral areas of the plant. Spanning these towers were large wood I-joists on 12-inch centers and a double layer of plywood. Temporary lighting was installed underneath the safety deck to illuminate the plant’s production floor. For Kustom’s crew, the deck itself provided a staging area for lightweight materials during the roof construction process. The safety deck was utilized in a series of 20,000 sq. ft. sections. As one deck was in operation, another deck was removed from a previous section, and yet another deck erected for the next section. This seamless approach enabled Kustom to maintain a continuous, highly productive work schedule. Mission completed at $2 million savings. 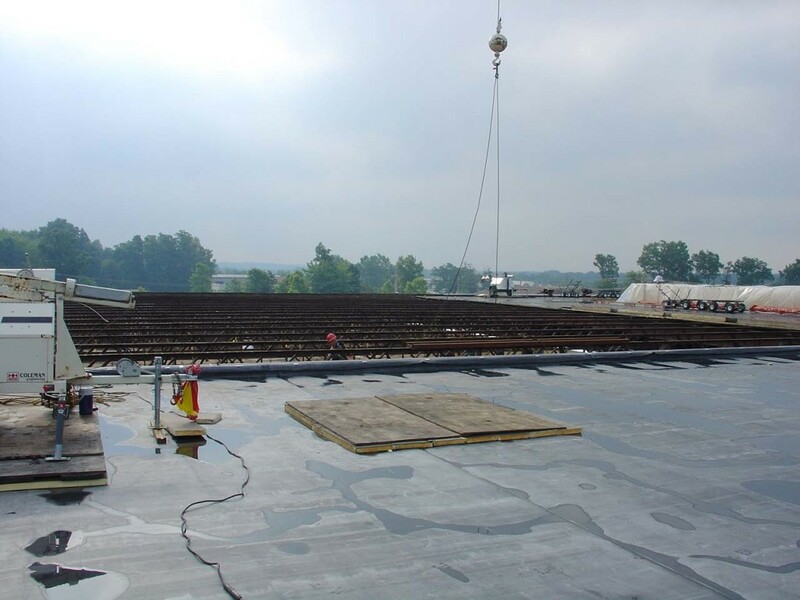 By developing the innovative Safety Deck solution, combined with a rotation of expert crews working 24/7, Kustom expedited the roof construction process without interrupting Accuride’s plant operations. The entire 150,000 square foot structural steel roof system was successfully replaced without incident and within budget. The combined savings for Accuride and the insurance carriers was estimated to be around $2-million.